On my way to work, this week, I spotted this idle ferris wheel. It was a rainy day and the carnival was shut down, until the rain was over. When I stopped to snap a photo, the sun broke thru, just enouh to make the spokes look a little golden. To visit other participants, go to SkyWatch Friday. This is very, very nice, Jan! You've found a way to use the grey sky as the perfect foil for the colourful Ferris wheel! Not much for the sky..but the big wheel makes one look up there in hopes of finding some sun or clouds. More than the sky, I'm amazed by that colorful ferris wheel! Awesome shot and brilliantly composed! 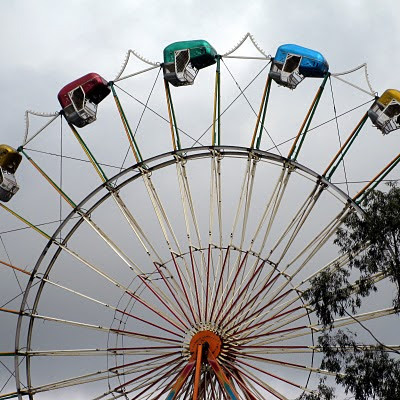 The moody sky is perfect to highlight the vivid colors of the ferriswheel. I love this! So creative! This is excellent. I like the comopsition, the lines and the colors. Good to see some colour on a grey day. A great post and feature for today. Enjoyed you blog very much. This is such a cool shot Jan. I do like the way the sun shines through the spokes. I'm not one much for rides, but I like ferris wheels. The Skydiver was always one of my favourite rides, great pic. Such a colourful shot against the drab sky. This is a great picture!! I love the way the color pops! The grey sky does make a good background for the colourful Ferris wheel! And the golden light on the spokes adds to the whole image! I love Ferris wheels. the seats look upside down. They don't stay like that do they? Or is that part of the ride? Never mind! I see, those are colorful canopies! I love the colours. Beautiful capture.